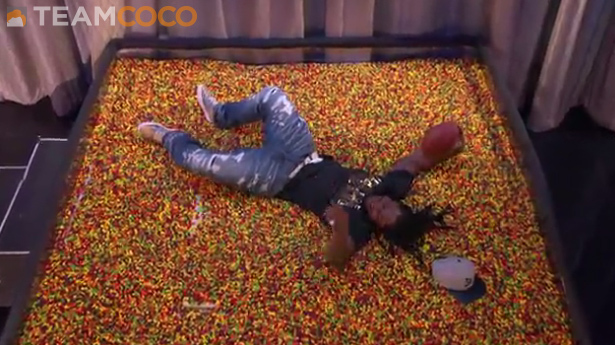 Seahawks running back and Skittle enthusiast Marshawn Lynch was a guest on Conan with Conan O'Brien Monday night. The host decided to combine Lynch's favorite candy with his favorite touchdown celebration: A backwards dive into an end zone full of Skittles. Unfortunately for Lynch, it did not beat out Chrissy Teigen for great Skittles moment of all time. In Monday's Clicks, I mentioned how a Twitter user named 'QueenChanelK' called out Sixers rookie Jahlil Okafor for being bad in bed. The investigative research team at BroBible did some sleuthing and discovered that the photos 'QueenChanelK' posted of herself on Twitter are actually another user named 'lyciaaa_'. The lesson, as always, is don't believe everything you read online. You may not like Zack Hample for playing hardball with Alex Rodriguez after catching his 3,000th career hit, but you have to admire the way he's enjoying his 15 minutes of fame. And by enjoy, I mean spending the day with one of the most world's most famous adult film stars. British singer Cheryl Ann Fernandez-Versini​, the artist formally known as Cheryl Cole and Cheryl Tweedy, turned 32 today. I've been a fan for years and she earns LLOD honors (click here for full-size gallery). Bulls rookie Bobby Portis met the media for the first time and brought three boxes of Stan’s Donuts. 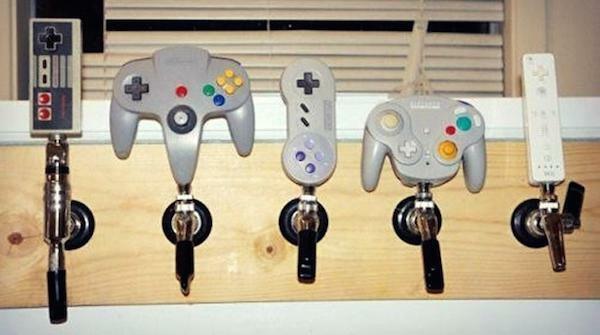 Why don't the bars I visit have video game controllers as beer taps? Mets rookie pitcher Steven Matz (who now has a sandwich in his honor) is really good at spinning random objects on his finger ... TJ Oshie's fiancee, Lauren Cosgrove, had a memorable bachelorette party ... Roger Federer honored Lleyton Hewitt's career by forgetting his home country ... Carmelo Anthony proclaimed his love for Kristaps Porzingis while on a double-date with wife LaLa, Russell Wilson and Ciara ... A former FSU mascot was stabbed to death over a gumbo recipe ... I'm very intrigued about what happened to Mike Richards that led to him being cut by the Kings ... The UVA swim team allegedly made some freshmen eat goldfish ... A dancing cop was the highlight of Sunday's Gay Pride Parade in NYC ... What highly successful people eat for breakfast ... A look at the Ghostbusters uniforms for the upcoming reboot ... Need a gift for your dog? How about a homemade ball pit. ​Hannah Davis shot some July 4th photos for SwimDaily and we brought a video crew to record the action. A fan ran onto the field during Sunday's Mariners-Angels game and managed to throw a fake pitch. Actress Monica Potter turned 44 today. Here's the Counting Crows song in her honor.